1. Can you create you very own font with everyday materials? In this assignment, you will create a handmade font. In order to understand the nature of the medium that you select for creating this font explore it in every way possible. According to what you learn about the medium create a font; it could be thick or thin, long or short, small and cursive etc. A rope could be used to create a cursive font as it is linear and connected in nature, but bricks on the other hand, would create a more heavy looking font, as they could be simply arranged or stacked. You could refer to books or existing examples on the web, but the idea is to have fun, and work playfully to create something unthought-of. • Medium: Any material/object, or a combination of them. • Aim: To create a completely handmade font from A-Z. • Process: Using a huge white paper/sheet as a background, arrange the objects to create each letter individually. Capture this using a camera from the top angle. This shooting can be done in open spaces/daylight or even indoors in a photo studio. • Goal: Have fun! And be crazy. Share your work. Discuss it as well. • Learning: An understanding of the medium, composing and shooting a photograph of the artwork, and understand of proportions, negative/positive spaces while creating the form of a letter. The goal of the assignment is to stimulate a different way of looking at things around us. Learning how to use their different qualities effectively in communication design. Some of the mediums might be tricky to work with and are purposefully challenging and some are easy to work with but all students should nonetheless attempt to use them effectively to create an interesting set of letters. 2. Try grouping mediums into different categories based on their qualities, and see what happens. In this assignment, you have to group different mediums into categories. The assignment is to make a list of 20 materials/objects, (you can be as crazy as you want with what you list here) and against each of them you have to write 10 words - they can be physical qualities, adjectives or feelings that you associate with them. • Aim: To create a list of materials and words associated with them. • Process: Using a blank ruled page list 20 materials out. Exchange them with the person sitting next to you. Then take some time to connect things/words with those materials. How would you describe it? What sort of a feeling does it impart, what adjectives are suitable for it? Once done, compare your list with other students in the class, and see if there are any overlapping patterns and materials, which you have described. • Goal: To understand the nature of the material, choose apt adjectives, get different ideas and articulate correctly. • Learning: An understanding of the nature of different mediums in order to use them effectively. The goal of the assignment is to understand the medium up to the point that we can use it differently. Not just use it for what it was created. Water was made for drinking, but I could create a font using water as well. Some of the mediums might be tricky to describe and write about, but all students should nonetheless attempt to make this list of words. Submit the list at the end of the day, so a comprehensive list could be made and copied out for all students. 3. ‘Having fun with Words’. The assignment is to choose one word, from a mixed bag of chits. Remember that word. Spend about half the day thinking, how you want to create it and what it should communicate. • Aim: Creating a word with a handmade font. • Process: Using a huge white paper/sheet as a background, arrange the objects to create the entire word. Capture this image using a camera from the top angle. This shooting can be done in open spaces/daylight or even indoors in a studio. Take care to edit and clean the image on Photoshop or any image editing software. • Goal: Learning how to choose the medium effectively to communicate the given word, well. • Learning: Selecting mediums and what the effect that different mediums could have on the same word. All students should attempt this assignment; it would be interesting to see what happens if 2 or more students select the same word, each student would express it differently. There should be a collective viewing of this assignment followed by a discussion. 4. Can you find a font in nature? And spot them in everyday objects? For this assignment you need to go out in the open spaces, lawns, corridors, outside buildings etc. or you can choose to sift through all sorts of everyday objects and spot letter forms, and capture them as an image. 'For example, look at this interesting letter A, it has been spotted amongst the criss crossing branches of a tree by a student and captured as an image. On the other hand this clothes clip makes a perfect capital 'A'. 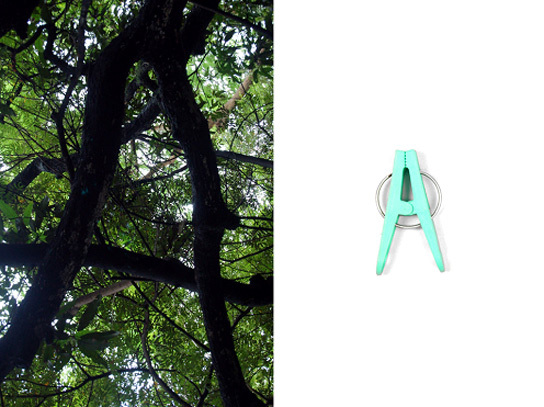 • Aim: To spot letters in nature and everyday objects that surrounds us. Try spotting at least 3 different letters forms. • Process: Go out, explore and try observing everything around you carefully, try noticing different forms, look at objects from different angles and perspectives, and you will be surprised with what you can find. • Goal: Making your observations sharper, and a sense of understanding the form. • Learning: How to spot interesting things in day to day life, which can add humor, interest, surprise to your work. Students should make an attempt to step out of the boundaries of a classroom, into the open, in order to understand and enjoy this assignment. More than learning it is about having fun with your work, and getting surprised by what each student can find, and where. It should end with a small exhibition with prints of all the images. It would be interesting to see what happens if 2 or more students spot the same letters, amongst different objects.